From Superman to Spaghetti- Enjoy! Here are some random pictures of us. Hope you enjoy!! And he is pretty darn cute- if I say so myself!! He is our little bundle of JOY!! Thanks Uncle John and Aunt Michelle for my Superman outfit! We love and miss you two! What is not to love about these two faces??? Chocolate Chip Pancakes are a favorite around out house! spaghetti. What a mess!! He would even get the snorts in here and there. for them to do, so occasionally, Evan will start to do it all on his own- no prompting needed. So far we are good and he has not tried this out in public...I am just waiting on the day! I must admit, it did make for pretty cute pictures!! Thank you for inviting us to your party! We had a great time!! We had a BLAST at our friend Wade's birthday party! We were at Pump It Up (a.k.a. germ city) and Evan loved every minute! He thought he was just as big as the other boys! The great staff pulled this out for Evan and he thought it was great! I tell you what, this was a workout! Those steps were killer!! But, we made it up & down! It was so much fun! Giving his Mama Sweet Evan kisses!!! Thanks Wade for inviting us to your party! We had a great time! The Little Love of My Life!! Evan was enjoying his Valentine's Morning Chocolate Chip Pancakes. They looked pretty good, huh? Valentine's Day is always so special to me because that is my dear Granny's birthday! We love and miss her very much!! around. We had a lot of fun building our snowman, even if we couldn't make it very large. All bundled up! Notice the boggin' is none other than Spongebob! He was mad because we wanted a picture and he wanted to get down and play! Just my little man and me. One of my favs of us together. It's a bird, It's a plane....NO! It's SUPER-EVAN! I guess we had played extra hard that morning. Too cute! Screaming because he can't get his feet to go where he wants them to go. Those are some mighty big shoes to fill, Little Man! Evan attempted to put his boots on all by himself. He must wear these shoes with shorts, with jeans, or with just his diaper! I have a country boy at heart! Smile and Say CHEEZE!! Evan LOVES his Aunt Pam!! One day while playing in his room, it got really quiet (for those who don't know, that means trouble!!) so I popped my head in to see what was going on and I found Evan perched on top of the twin bed in his room. At this point we did not know that Evan could climb that high, so please imagine my surprise. I did run and grab the camera for a pic before I told him to get down and explained that this was not a play space. Think it did any good? Nope! It is still one of his most favorite places to climb and look at books!! Going to watch the Tide Roll! Mrs. Kristi and Wade gave Evan this cow for his 1st birthday. He lovingly refers to him as "Moo-Moo." Evan sleeps with Moo-Moo each and every night! We waited and had "Santa" Christmas at our house late Christmas Day. Really and truly, Evan did not know the difference. We had a great time. It was so much fun to watch Evan this year. He found a lot more excitement in watching everyone else get so excited over what they got. He is a hoot! Hope you enjoy the pictures! We had a lot of fun and did some things a little nontraditional. Christmas morning, then traveled home to have Christmas with just the 4 of us. We had a great time and made a lot of new memories. Along with the laughter and fun came some sorrow as this was our first Christmas without Granny. Man did she know how to have a good time. She may be gone, but she will NEVER be forgotten. Love to you!! 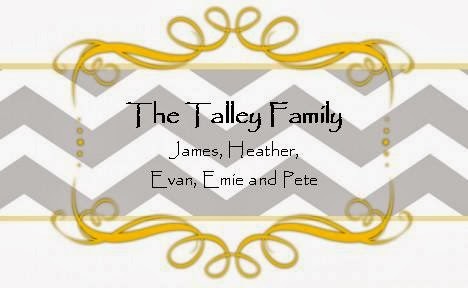 Merry Christmas from the Talleys! Evan really enjoyed his drums from the Wallaces. oh does he LOVE to bang on them when we visit!! He loved his goodies in his stocking. This reindeer is still in his room! one and opened presents by candlelight. It was different to say the least! Ah, memories!! E loves his Uncle Tim! Outdoors at Bass Pro Shop after having his picture made with Santa. Evan loved all of his new goodies. Thank you Mimi and Papa for the music set. The drums have brought A LOT of heavenly sounds to our home!!! Sweet friends Laura Beth and Jenn with me at our Christmas Party. I forgot to flip before I posted, sorry! (Above) One of my most favorite pictures of James and me. I love him oh so much! (Below) We were trying to get a good shot for our Christmas pictures. This was one of the cutest ones of Evan and Pete together. They are sweet together! Evan was checking out the ducks on the pond behind our house. He loves to be outside. Here he is just hanging out and being silly. Go ahead and say it...AAAWWW! Thats what I said when I took it. One of my favs of my two boys!